See here more Details, please discuss the car here in this thread. Thanks to Robb for posting the car and good luck with the sale. d. Commscope – Frank Drendel - designs and builds the connectivity for many of the world's most advanced cable and internet networks. 3. Car is a factory built Challenge Car and is one of 40 Final Evoluzione versions - authentically restored with all original parts and correct livery. 4. Fully documented race history, maintenance and ownership history. 5. Very well maintained example – It has a new gas tank and all new fuel lines – those two simple items should tell you plenty on it’s current condition and caretakers. 7. No leaks or drips. No Check Engine Lights. No Slowdown Lights. 4. All Plastic Parts (that are known to get sticky) have been refinished and restored with lazer-etched , proper graphics by Sticky RX. 6. Robb Williamson and his brother – February 2015 to Present –Corporate Location Photographer and Doctor, owners of other Ferrari F355 Berlinetta, Ferrari F355 GTS, Ferrari 328 GTS. 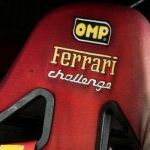 You will find very few Ferrari Challenge cars anywhere in the world more complete. Few F355 Challenge cars come up for sale in a year. When you see one, look closely for what it is “not” coming with. Look at all the parts that are not original or what it is missing. Many of the cars in the US ran in the SCCA racing series and lost much originality with changes to the car because of their different regulations. Then look to see if the car looks like rats have made it home with owners that just did not care and put away very wet without much care. You will find many challenge cars in this condition. It will take quite a lot of money to bring them back and that is just the aesthetics. All the small things add up. We have seen other challenge cars with mechanical difficulties due to lack of use and owner neglect. I’d think most buying a Ferrari for the track would love it to run like an industrial sewing machine – one that just purs and goes and goes, and goes without issues. If a car is missing parts – they are likely to never be seen again. Then there is the question about the car’s sponsorship. Was it sponsored by a local dentist or did it have backing like The Discovery Channel, Speedvision, and major Cable Entertainment Channels? It would seem that the latter is likely to look great anywhere and will continue to hold interest and demand throughout the future. Does the car have interesting history? Do you know what place it finished or is there no clue as to it’s original driver and their story of how they got involved in the series? So if you are looking for a complete car and one that you can proudly put in your collection, look no further. We started with a good Ferrari – it is now a great Ferrari. It’s now up to the new owner to pick and choose how to enjoy. The sky is the limit. F355 Challenge car values seem to float around $130k for a car without history – these are usually missing many original challenge parts like seats, the roll cage, brakes, etc – or one that looks like it has sat with the rats and was put away very wet. There is a huge difference between the lower priced cars and the higher priced cars. There is also a difference in value for the Factory Challenge cars and Evolutione cars which are rarer in number. The nice cars have been sold for as high as $245,000 to collectors in Europe in recent history. This car is priced firmly at $185,000 based on completeness of records, parts, and famous corporate sponsorship. We are open to trade(s) of other Ferrari’s or challenge cars. The car comes with a B&W Xerox copy of the MSO (Manufacturer’s Statement of Origin). Depending on different states or countries, this may enable a collector to register the car for street driving. We are still working with the original driver who is searching his storage for the original document. – But the car is definitely better suited on track with its precise, and tight suspension, lower ground clearance, and other track focused features. It shines on the track and will leave many newer street Ferrari’s in the dust there. If you are a collector and want a Challenge car with unique history and fame, then look no further and just enjoy. Contact me for further information. Hope the new owner appreciates the car. Very well sorted car, a beauty !!!!! The 2nd 355 EVO I have seen over the last years! Few days ago 355 EVO Laispower changed owner, if I am right! My information from my Ferrari dealer is that 1998 only 30 EVOs were produced!!!!! Info from my dealer is that only 30 EVOs are approved!!!!!! Last edited by ShaneLewis on Tue 28. Feb 2017, 20:00, edited 1 time in total. So cool, I like livery and colour, price fits! Whats the asking price please? This car is from the US? Does anybody has experience to ship car to UK??? Costs don't matter, how long does it take and what about the safety!!!!! Please help me with experiences, thanks!